Book – Non-fiction. By Mark Nowak. 2009. An expose of the coal industry using a combination of poetry, images, first person testimonies, and newspaper accounts. 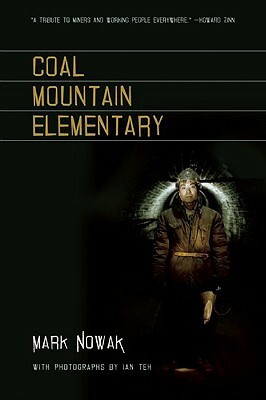 In this startling book, poet Mark Nowak weaves together four strands: excerpts from Chinese newspapers about coal mine accidents, personal testimony from the 2006 Sago, W. Va., mine disaster, coal country photos, and lesson plans on coal mining from the American Coal Foundation. The juxtaposition of coal- mine-induced tragedy and the coal industry’s lesson plan propaganda makes for jarring reading. Coal mining “is a job for living people working in hell,” says the sister-in-law of a miner killed in a coal mine gas explosion. Meanwhile the coal industry curriculum manipulates students to see the world from the standpoint of owners. “Was making a profit easier or harder than expected?” the American Coal Foundation tells teachers to ask students in a lesson plan that uses chocolate chip cookies to simulate coal mining. Coal Mountain Elementary is an odd but brilliant critique of curriculum that ignores the working people who produce all wealth. “To call Mark Nowak’s haunting new book a collection of poetry would be a bit of a misnomer. It would also be misleading to say Nowak is its author. The poems in Coal Mountain Elementary comprise three strands of found text; Nowak has selected and braided them, achieving an arresting effect. This is a book that exposes the darkest reaches of the global coal industry by using the industry’s own means—politely referred to as “extraction”—to lay bare the official language used to obfuscate mining’s human and environmental impact and to recover the far truer language of miners themselves.” —Maurice Manning, Book Forum, Read full review. Review in Jacket2 by Dan Featherstone. ISBN: 9781566892285 | Published by Coffee House Press.